Jenkins is an open source application that monitors execution of repetitive jobs, such as building a software project or jobs ran by cron. It’s written in Java programming language and designed to test and report on isolated changes in a larger code in real time. Basically, Jenkins is a Continuous Integration server which is the best practice of running your tests on a non-developer machine. So the builds on top of Continuous Integration are Continuous Deployment and Delivery where after the successful tests you will be able to run, instantly and automatically release with the latest version of your codebase. We can say Jenkins makes deployment a non-issue and helps you speed up your development. 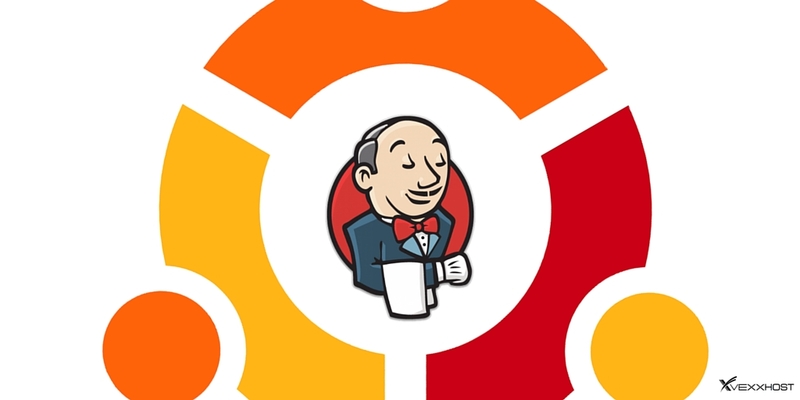 Furthermore, in this article we will show you the step by step installation and configuration of Jenkins on Ubuntu 14.04. There’s no complex requirement for Jenkins but you must have sufficient superuser privileges to perform some basic installation tasks on your operating system and your system should be properly updated with the latest packages. Furthermore, Jenkins requires to have any basic web server installed on it. 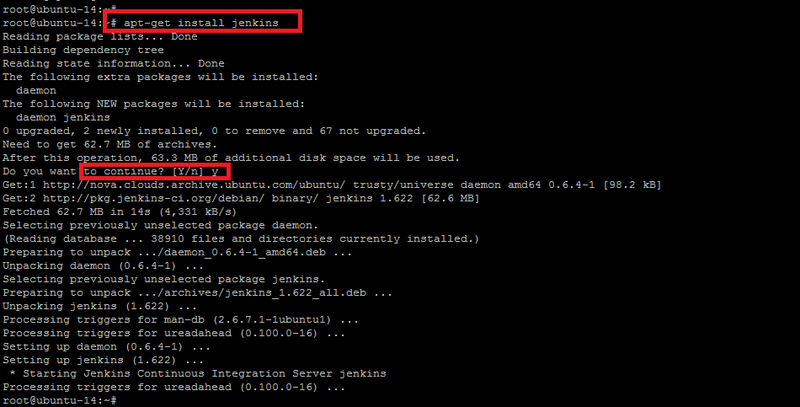 So, let’s start the setup of Jenkins on Ubuntu 14.04 LTS operating system. Run the following command to update your operating system before moving on to other packages installation. Jenkins requires the basic web server installed on your system, so if you don’t have any of your web server installed on your operating system, you can execute the following command to install the web server. This will be installing Nginx web server. If you are more comfortable with a different web server, you can also choose other web servers to be installed. 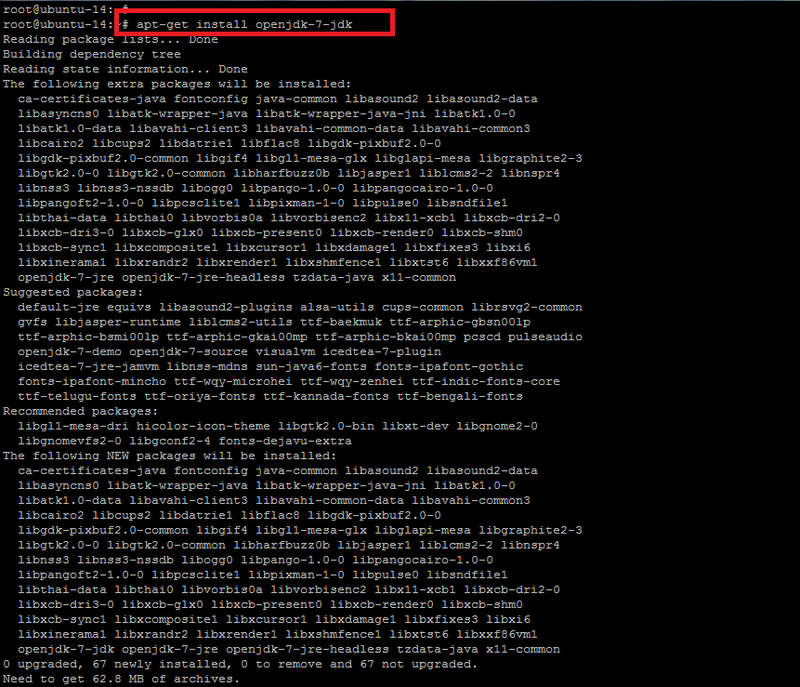 Once your Nginx web server is installed check the status of its services with the command below. It means `Nginx` is working fine, so let’s proceed to next step. Now install the Java first through the `apt-get` package manager. For this purpose, you will need to install open source implementation of JAVA Version 7. This is quite easy to do so by executing the command below. When you execute the above command, it shows you the list of other recommended and required packages to be installed with Java `openjdk`. To proceed with those packages, you have to press `Y` or type `N` to exit the installer. It will take a few minutes to complete the Java installation. Once it is done, run the command below to check the installed version of Java on your system as shown. Now it needs to update `apt’s` cache before moving to Jenkins so that it can refresh the operating system’s repository for the latest packages. Once your system is updated, execute the command below for the installation of Jenkins and type the `Y` key to proceed with the installation process. The installation process will end up with starting its daemon. To check the status of Jenkins service, the command below will show you its status with running process ID. 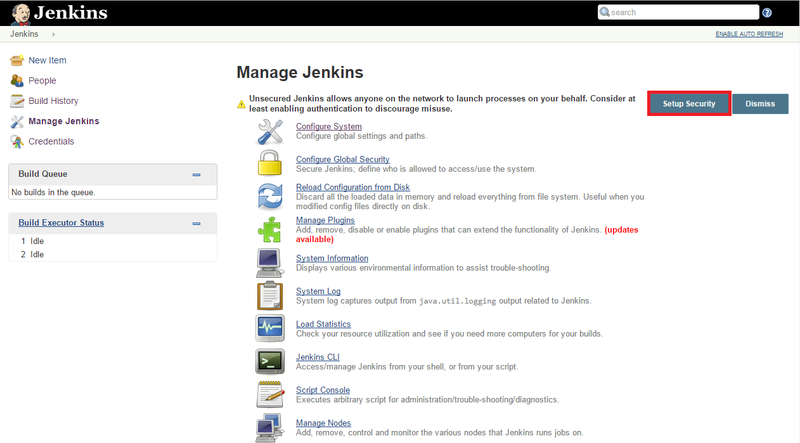 Jenkins service run with its default user name `jenkin`. Jenkins runs on port 8080 by default for HTTP connector. Now let’s open your web browser to use its GUI. You will be surprised to see its welcome screen where you will be able to configure its different parameters for your system. Click on `Manage Jenkins` and then choose the required parameter to start required configurations. 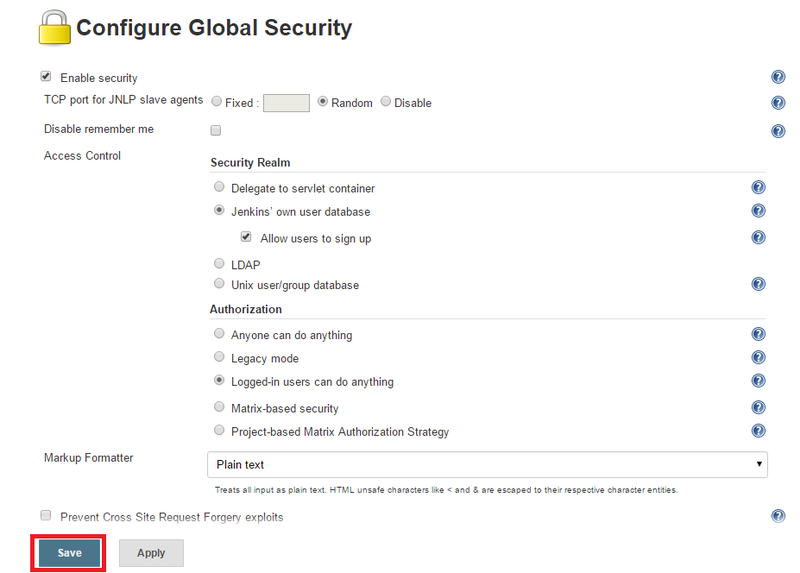 Consider enabling authentication to discourage misuse by configuring Jenkins global security parameters and then apply to save the changes as shown. To configure the global settings and paths for the Jenkins configurations, we’ll make a few changes to enter the correct path to your JDK, Apache Ant and Maven. Jenkins can also install these for you automatically. Once your settings are done, press the Save button to update the changes shown below. Before you save the changes, make sure to login into Oracle’s account first if you are installing Java. We will use Jenkins Plugin Management to add, remove, disable or enable plugins that can extend the functionality of Jenkins. 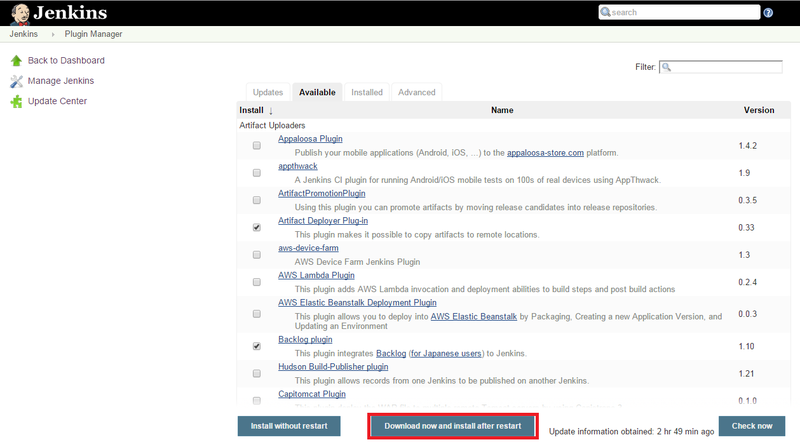 To install plugins in Jenkins, select the `Manage Plugins` link and search for the plugin you want to install. Select it from the list and click to download and install button. 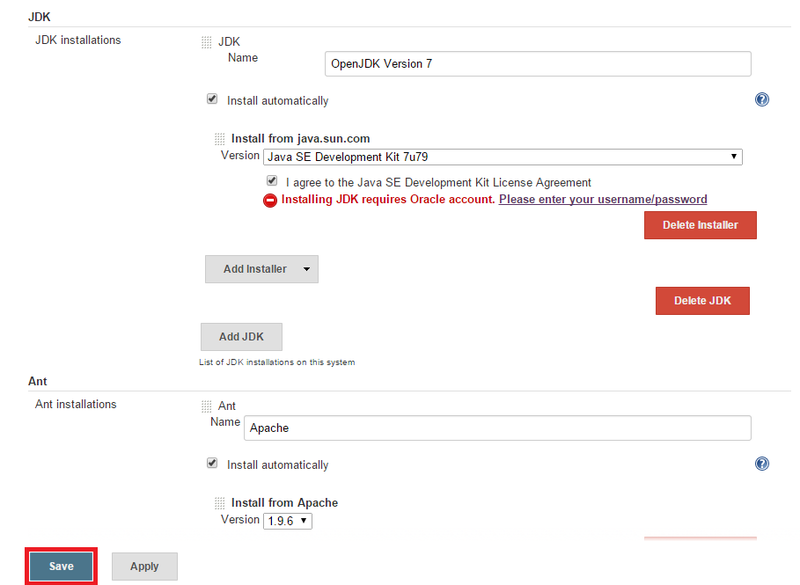 Check the option to Restart Jenkins when installation is complete and no jobs are running as shown below. After choosing the Restart option, you will be redirected to the Jenkins Restart Page, it will take a while to install the plugins you chose. To schedule your new jobs, click the `New Item` on the top left of your Jenkins Dashboard, then enter a name for the job and select `Freestyle Job`. Press OK to create a new Job. The next page allows you to configure your job, so give it an appropriate name. From the bottom, expand the `Add Build Step` option and select `Execute Shell` where you will put the command that you wish to execute in the terminal, we are using the `w` command here to check the system load and currently logged in users. Once the next page is done loading, click the `Build Now` button on the sidebar of your dashboard. Greetings! Here is the output of your first job as shown below, you can also view it in plain text, edit or delete the build if you wish to do so. Jenkins is an incredibly powerful tool. While not as nice to set up and manage as some other build servers, it is incredibly powerful with a lot of flexibility, and to be honest, it’s really hard to complain about an enterprise level build server for free.